Billionaire US investor Warren Buffett has donated another $1.78bn (£1.1bn) to several charities, with most going to the Bill and Melinda Gates Foundation. 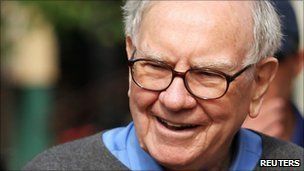 Mr Buffett has given the charity run by the co-founder of Microsoft 23.31 million shares in his investment company Berkshire Hathaway. The shares were passed to the foundation on Wednesday, when they closed trading at $76.52. Mr Buffett, 80, plans to give away 99% of his wealth. He first announced this in 2006, and this week's giant donation is his sixth since then. Other shares transferred on Wednesday have gone to four charities run by his family. These include the Susan Thompson Buffet Foundation, which was named after Mr Buffett's late first wife, and charities run by their children, Howard, Peter and Susan. Mr Buffet has now donated more than $11bn of shares in Berkshire Hathaway. Described as the "Sage of Omaha" because of his investment acumen, Mr Buffet is the world's third-richest person, worth an estimated $50bn.